Sugar Plum Farms is one the most beautiful places in Western North Carolina with the natural scenery of the mountains, trees, Carolina blue sky and the pond with the ducks. 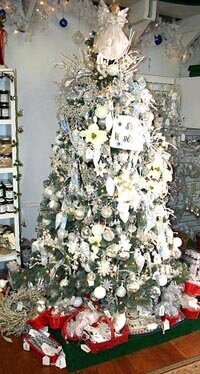 To add to this natural beauty James and Helen have created a special treat for visitors with their Christmas Shop. Inside you will find beautifully decorated theme trees, angels, hundreds of ornament, tree skirts, gift baskets, tree lights, decorative wreaths and much more! 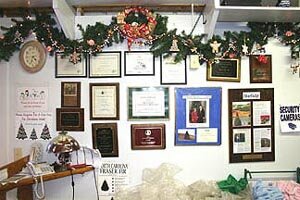 Come visit them during the holiday season or contact them for a farm tour or field trip. James and Helen have received numerous awards and recognitions for their quality of products and hard work. Winter Wonderland Tree featuring white and silver ornaments of all kinds including glittery drop pendants and crystals of all kinds. James and Helen have added a another facilty to Sugar Plum Farms. The building is a multi-purpose building that can accommodate 150-200 guests. The building is ideal for having meetings or a great place to sit down with associates for a wonderful meal while touring the farm.